Dental hygiene is extremely important, yet it is something that people often neglect when travelling. Even if you do a good job taking care of your teeth at home, sometimes it is not feasible to take your dental cleaning equipment with you, such as your countertop water flosser. That is why Waterpik came out with the WP-300 Traveler (WP-250 Nano in the UK) to help you keep your teeth clean while abroad. The Waterpik Traveler is half the size of a regular countertop water flosser, but just as effective and you can take it with you wherever you go. Using the included premium travel case, it is convenient to carry around and pack into your luggage. Even if you are traveling overseas, the Waterpik Traveler has global voltage compatibility so you can plug it into all outlets without needing to spend extra on a universal adapter. The Waterpik Traveler is capable of holding 450ml (15oz) of water, which is more than enough for 60 seconds of continuous use on the highest pressure setting. If you decide to use a lower pressure setting, it can last twice that time. There are measurement lines located on the side which is useful if you want to administer medications. 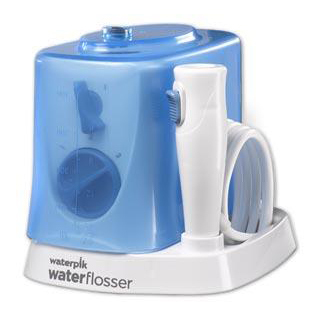 Since this water flosser is designed to be portable, you can actually flip the water reservoir upside and place it over the body, acting as a protective cover and space-saving feature. On the base unit, located at the front are the power switch and pressure dial. There are three pressure settings. The lowest setting (1) is 10 PSI, (2) is 45 PSI, and the highest (3) is 80 PSI. We think most people would prefer to use at least the second pressure setting, as we felt the lowest setting was a little weak. If you’ve never flosser before, however, then start with the lowest and slowly work your way up. By the side you will find the flosser handle, tubing, and flosser tip. You will have to connect the flosser tip to the handle by pressing it down into the hole at the top until you hear the click sound. The handle is quite disappointing. The only thing to note is that it has an eject button to facilitate the removal of the flosser tip. Higher end models typically have the ability to pause the flow of water, and also allow you to rotate the flosser tip 360 degrees to give you complete freedom when flossing. This handle does not, so you will have to maneuver the entire flosser handle if you need a better angle to remove plaque on your teeth. Speaking of tips, the WP-300 comes with four tips already included. They are as follows: two standard flosser tips, a plaque seeker tip, and a Pik Pocket tip. The standard tips are good for general purpose flossing. The plaque seeker tip has a tuft of thin bristles on the end which you can use to scrape the plaque off your teeth while flossing at the same time. The Pik Pocket tip has a narrower opening point which further focuses the water stream, making it an excellent choice for cleaning periodontal pockets. Waterpik have included a premium travel case for your WP-300 Traveler/WP-250 Nano. It has lots of thick padding inside to protect the unit from damage while travelling. Furthermore, it can also store your extra flosser tips on the flap at the top so you don’t have to get a separate bag and worry about losing or damaging it. One gripe that we have with a lot of portable flossers is that they typically do not function when overseas because they can’t handle higher voltages. According to the sales page, this device has global voltage compatible so you can theoretically use it anywhere. However, some users have reported that they have fried their unit by plugging it directly to an outlet, so we would advise you to use an adapter just in case. Is the Waterpik Traveler Worth It? 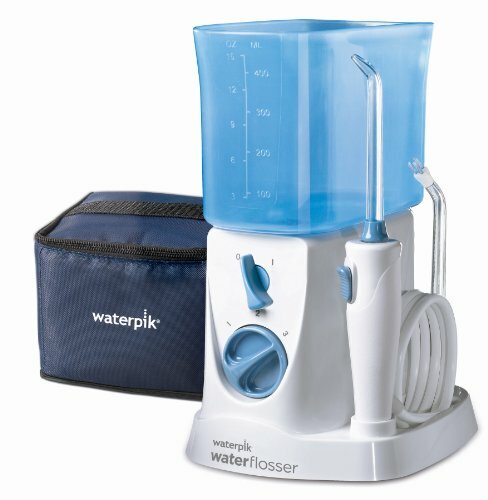 There are a few minor gripes we have with the Waterpik Traveler water flosser. First, its pressure settings do not have as wide of a range as other countertop flossers. Furthermore, its flosser handle felt flimsy and cheap. It does not have a swivel feature and you cannot rotate the tips for a better angle. We have heard stories of people frying their unit when plugging it into 220v outlets. With that said, it has the same cleaning power as a countertop water flosser and is compact enough to take with you on trips. The included flosser tips and premium travel case allows you to be flexible with how you floss and facilitates easier travel. The large water reservoir (for a portable product) lets you floss to your heart’s content without worrying about the water running out before you’re finished. Overall, we feel the Waterpik Traveler is a an affordable product that you should consider using to maintain your dental hygiene while traveling.